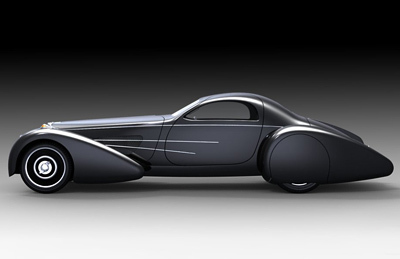 The "Bella Figura" Bugnotti Coupe is a design from Delahaye USA based in Long Valley, New Jersey. The first car is currently under construction and should be finished in time for the 2010 Pebble Beach Concours in Monterey, CA (13th - 15th August). 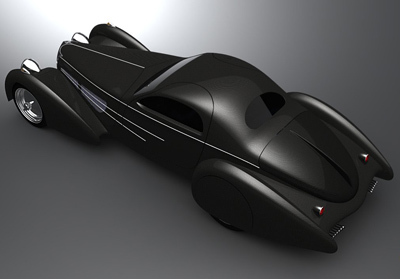 The shape of the car was influenced by the Bugatti Type 57S - hence the 'Bugnotti' name. Several different versions and models of the Bugatti contributed to the car's styling. 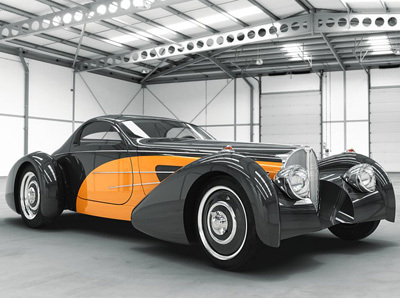 Ralph Lauren's 1937 Bugatti Type 57SC Gangloff bodied Drophead Coupe - which was designed by Ettore Bugatti's son Jean - was the inspiration for the rear quarter of the car. 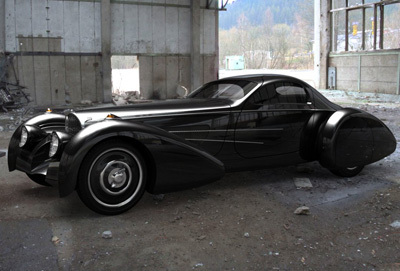 The "Bella Figura" Bugnotti Coupe features a choice of either alloy, carbon fibre or fiberglass bodywork, which is laid over a custom made chassis with two different suspension options. Either a Bugatti-style beam axle setup with elliptical springs, or a conventional upper and lower A-arm suspension system will be available. Delahaye USA have stayed rather vague about the drivetrain options, stating only that it will use a "late model powertrain (your choice of engine)". The interior will get modern equipment too, like air conditioning, power brakes, power steering and power windows. All in all it's an original project. However with a price tag of $250,000 for the carbon fiber bodied version, and and even more drastic $450,000 for the alloy bodied model. It remains to be seen whether many punters with tastes for classic cars with modern underpinnings will hand over the cash.